Annuals, biennials, or perennials; (short-lived); with a fine taproot; usually densely pubescent, trichomes (sessile or short-stalked), 4-7-rayed, rays distinct and furcate or bifurcate, (nearly smooth to finely tuberculate). Stems several from base, erect to decumbent or prostrate, (unbranched or branched, sometimes densely leaved), 1-3.5(-4.5) dm. Basal leaves: blade obovate to broadly oblong, 1.5-5(-8) cm, margins lyrate-pinnatifid, dentate, or entire. Cauline leaves: (proximal sometimes petiolate, distal sessile); blade linear to oblanceolate, often falcate, 1-4(-7) cm, (proximal with base sometimes cuneate), margins entire, repand, or shallowly dentate. Racemes dense. Fruiting pedicels (divaricate-ascending, sigmoid or, sometimes, nearly straight), 5-15(-25) mm. Flowers: sepals elliptic or oblong, 3-6.5 mm, (lateral pair subsaccate, median pair thickened apically, cucullate); petals (widely spreading at anthesis, yellow to orange, claw sometimes whitish), cuneate, obdeltate, or obovate, (tapering to claw), 5-8(-10) mm, (claw often widened at base). Fruits (shortly stipitate), subglobose, not or slightly compressed, (3-)4-8 mm; valves (not retaining seeds after dehiscence), glabrous throughout; replum as wide as or wider than fruit; ovules (8-) 12-20(-26) per ovary; style (1.5-)2-4(-5) mm. Seeds flattened. 2n = 12, 32. Flowering Feb-Jul. Sandy or light soils, rocky plains, caprock ledges, gravelly brushland, sandy desert washes, stream bottoms, pastures, roadsides, abandoned fields; 150-1700 m; Ariz., Kans., N.Mex., Okla., Tex., Va.; Mexico (Chihuahua, Sonora). 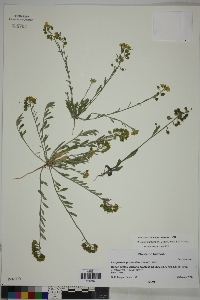 Physaria gordonii was reported from Virginia in 1987 by Robert Wright from a Hampton Shale roadcut along the Blue Ridge Parkway, where it was probably a short-lived waif. 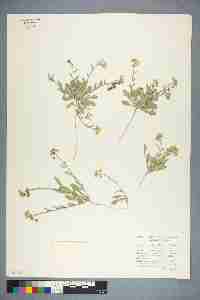 Subspecies densifolia, of Lincoln County, New Mexico, of which there is now more material than Rollins had available in 1993, appears to represent a suite of environmentally determined, variable, and intergrading characteristics that does not merit taxonomic recognition. 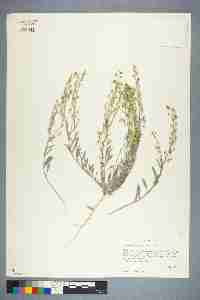 Duration: Annual Nativity: Native Lifeform: Forb/Herb General: Annual to short-lived perennial herb, 10-30 cm tall, from a slender taproot; stems several to many, erect to decumbent or prostrate; herbage usually densely pubescent with stellate hairs; hairs sessile or stalked, with 4-7 rays. Leaves: Basal leaves usually present, petiolate; stem leaves alternate, short-petiolate; blades oblanceolate to linear, 1-8 cm long, the lower leaves sometimes with wavy or toothed margins and the upper leaves entire. Flowers: Yellow to orange, in terminal racemes which are compact in flower and elongating in fruit; pedicels ascending to spreading in flower and in fruit, straight or S-shaped; sepals 4, oblong, 3-7 mm long, the lateral pair slightly sac-shaped at the base; petals 4 in a cross formation, obovate to wedge-shaped, 5-10 mm long, yellow to orange. Fruits: Capsules globose, 3-8 mm long, glabrous, topped with a persistent style 2-4 mm long; seeds flattened. Ecology: Found on rocky plains, caprock ledges, gravelly brushland, sandy desert washes, stream bottoms, pastures, roadsides, and abandoned fields, below 5,500 ft (1676 m); flowers February-July. Distribution: AZ, NM, TX, OK, KS, VA; south to n MEX. Notes: Physaria species (until recently classified as Lesquerella) have gray-green leaves, often with stellate hairs; white or yellow 4-petaled flowers; and round, globe-shaped fruits with a persistent style attached to the tip. P. gordonii distinguished by being an annual (occasionally short-lived perennial) with dense stellate hairs; the stems are often decumbent (growing horizontally along the ground, with the tip of the stem turning upward and ascending); with cauline leaves often pointing upward and overlapping; flowers with showy yellow petals; and seed pods on mostly horizontal, s-shaped stalks. One of the important key couplets in the Lesquerella group has to do with whether or not the rays of the stellate hairs are fused to each other. P. gordonii leaves have stellate hairs with fewer than 10 rays, and the rays are not fused to each other, with some of the rays forking into more than one branch. This can be difficult to see without a dissecting scope, so try to collect as much of the plant as possible for proper determination. P. gordonii is widespread in the desert and in some years has truly remarkable blooms. Ethnobotany: Unknown, however other species in the genus have uses. Synonyms: Lesquerella gordonii, Alyssum gordonii, Vesicaria gordonii Editor: SBuckley 2010, AHazelton 2017 Etymology: Physaria comes from the Greek phusa or physa, "bellows" because of the inflated pod; gordonii is named for Alexander Gordon (c. 1795?) an English horticulturalist and nurseryman.